Recently, I was working with the Managing Director of a media company who was looking for support after reorganising all their client facing functions, from marketing to supply. She felt levels of engagement in the organisation were too low as a result, and the reorganisation needed to be stabilised. 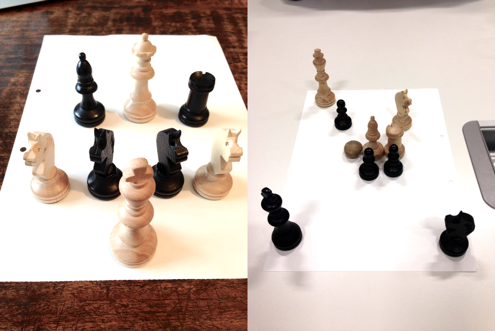 I ran a number of interviews, using a chess game to map the leadership team. Several forgot to represent the managing director on the map, or isolated her in a corner of the map. It turned out that they felt she was not really owning the reorganisation nor addressing some of the consequences. What was achieved with the visual medium in one hour was so much and more precise than through a regular interview. Written and oral language dominate as a medium of professional communication. There are good reasons for using words in the first place. We work hard at developing a good narrative about ourselves, our role, our environment and the groups we work with. This allows us to be more eﬀective and increases predictability in our working relationships. But it can also lock us into certain patterns. Words can give at times the illusion of providing a clear meaning. We have all experienced a conversation when we observe or feel a gap between the body language and what is said. So how can the gap between what is intended, expressed and understood be reduced? A good dialogue requires people to go beyond the roles they have, play and the narratives built around them. It means acknowledging the informal, invisible and sometimes irrational intentions and forces. By listening more deeply to yourself, you connect better to those forces that drive so much of our interactions with others and within organisations. It is a complementary form of intelligence that we do not access as frequently. In other words, by listening better to yourself, you will also express yourself more authentically. It is no coincidence that the Chinese character for “listen” combines the signs for ear, eyes and heart. A few years ago, I worked with the partners responsible for changing th compensation model at a large consulting firm. I doubted how aligned the team was. It was brought into the discussions but nothing came up. So, we changed to a more visual method to express the scale of the anticipated change, for their firm and in their role as compensation review partner. I invited them to position themselves on a “line of change” on a flipchart. At one end, no change implied, at the other significant change. They were broadly in agreement about the scale of change for their firm, but one partner placed himself on the extreme change scale in his personal role. The visual line gave him space to connect with an inner anxiety about the impact on the decade long-personal relationship he had with some of the partners most impacted. In fact, it helped him to better listen to himself. The team of partners were able to address many of his concerns and reinforced alignment before the first round of communication. 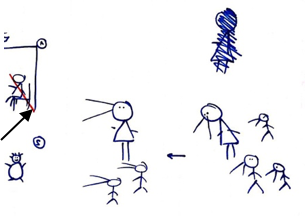 The potential of metaphors can also be seen with drawings. In a coaching setting, a self-portrait around key career and life events of a person can reveal new insights. In the self-portrait shown here, the person realised how she had not fully recovered from a previous highly unsatisfying role (the red line). A seemingly small detail that helped understand the source of a current pattern of self-doubt. Using visual language can ease expression by making it more concrete and instant. For people who are more introverted and find it diﬃcult or unpleasant to share some of their inner thoughts, using visual language becomes an enabler. The reverse also works when more extroverted people find that they can connect more with the essence by concentrating on the visual rather than be taken over by the energy and flow of words. Using a more visual and 3-D approach to communication has many benefits beyond the surprise or even initial resistance when objects unfamiliar to a business environment are pulled out of a bag onto a desk like chess pieces or even Playmobil or Lego! Objects can be very useful to map an ecosystem with a complex set of relationships - as with the media company example above which was part of a global matrix organisation with very independent minded country sales people. The use of representatives enables to see yourself fully by essentially stepping outside of yourself. Representatives are also used to describe perceptions, express senses, feelings and the dynamics of relationship with others. By using objects, we call upon our visual mind which is spontaneous with less mental filters. Experimentation is also a key feature of using objects. As you place objects, nothing is set in stone, everything can be readjusted for as long as needed, the individual can experiment safely including exploring what needs to be changed in a map to address a diﬃculty. A real emotional connection is often created with the representative objects, it can be felt in the way they are touched and looked at. There is a real life feeling about it, almost as if directing a movie. Objects can provide an opportunity for giving feedback visually which combines a soft message with a powerful image. When getting teams to produce maps of their interactions, bosses regularly discover how they are really perceived by their teams - favouring some members by being really close to them, not being on the front line etc.… The images to the left show how the boss sees himself (white king) and how his deputy does (picture to the right). The boss realised the gap in perceptions and worked out with the team what was feeding this gap. In another project with a large European bank, it was clear from the map that the US team was on the periphery and finding it diﬃcult to integrate. No one expected it but it became clear this might be the real reason for what seemed like just a clash of personalities. Good dialogue does not happen without deep listening. What are you paying attention to in a dialogue? Your own thoughts, how you can prepare for the next winning argument or are you making a genuine eﬀort at listening to the other without being polluted by other factors? If you are listening deeply, you might be aware of how your own thoughts and emotions impact your ability to listen - as if you were practicing mindful listening. A good indicator of a dialogue can be observed through the quality of silence, from no silence which might feel like a hot debate in which everyone speaks (at the same time) but no one listens; all the way to empathic silence which gives space to listening to the whole person (verbal, body) and makes for a richer quality of connection. So, for instance, in the self-portrait described earlier, the drawing contains a lot of personal data and emotions which can generate more respect for a person and a genuine desire to listen - from person to person rather than from role to role. 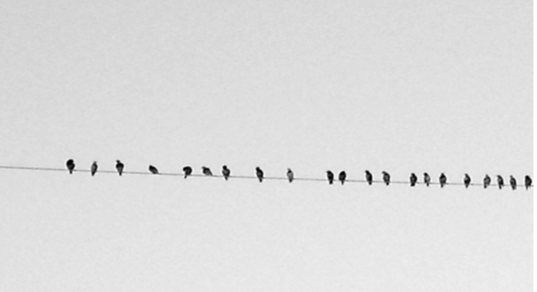 In a team setting, collective listening is valuable as a process to reinforce team alignment. The visuals created can contribute to building a shared mental map of team dynamics and roles. Powerful and long-lasting images help to create a shared vocabulary in a team. An executive team in the pharmaceutical industry aﬀectionately called their regulatory counterparts - the “chewing gums” (those were the objects available on the table and chosen as representatives for the team). It was the job of the “chewing gums” to ensure the ethical standards were respected, they did so with perseverance but not always with suﬃcient regard for the business cycles of the operational teams. The importance of their role and contribution was highlighted by the sweet “candy” metaphor. and… remember that a good dialogue takes time! Leaders shape their organisation through the decisions they take; it is one of the main expressions of their power. In fact, it can be seen as their main role. In this blog, Christopher explores how leaders can overcome the binary top-down/bottom-up perspective to leadership and decision-making. "As we debate the nature of narcissism, we find ourselves in the midst of related and unrelated definitions used in different clinical concepts in psychiatry and psychoanalysis." Narcissism, what is it and what do we do about it? In the third blog in our KDVI Blog Series on Narcissism, we explore the clinical connotations of narcissism. Its origins, definitions in psychiatry and psychoanalysis, and implications for coaching individuals with narcissistic tendencies are explored. Why would anyone be attracted to a cult? Many businesses have cult-like characteristics which, on one hand, can provide structure and order, on the other, they can breed paranoia and stifle creative thinking.